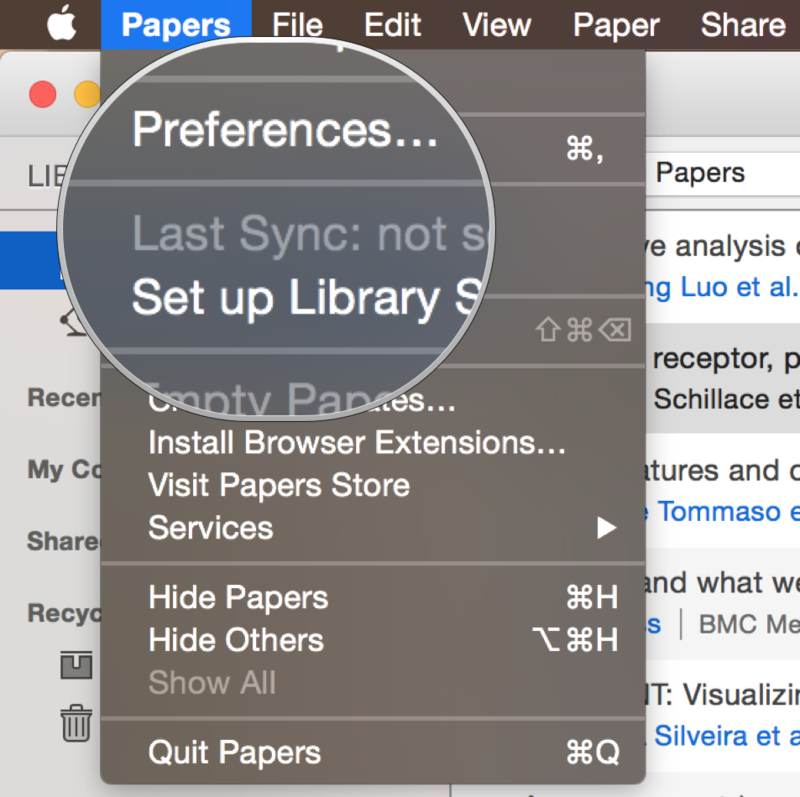 Papers lets you organise your documents on your disk the way you want. Whether you want your documents organized in subdirectories by journal, by author last name, or a hierarchical combination of both, Papers manages all the documents in your library automatically. You can also rename your documents the way you prefer. The below instructions describe how you can organise and rename the PDFs and other documents inside your Papers library. However, in case you are syncing your library across multiple devices either via Dropbox or Wifi, we require unique names for your PDF files, which means that the file organization and renaming doesn't apply to the actual Papers library but the Virtual File System we have designed, to allow you to browse your files with custom names in Finder. For further instructions how to use the Virtual File System continue reading this article. By default, your library is stored at Documents/Library.papers3 . 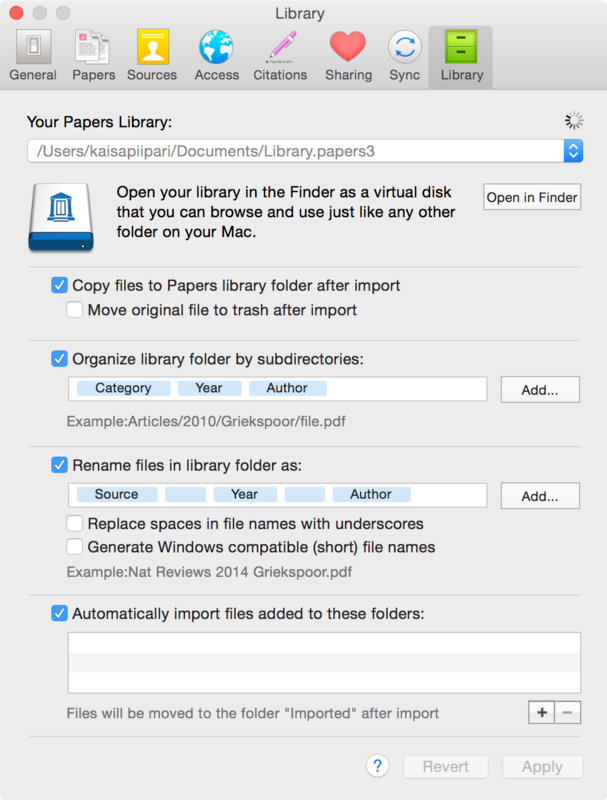 You can change the location of the Papers Library Folders at any time. Simply click on change to choose the destination for your library. If you do want to use subdirectories, you specify by what parameters Papers should organize your library. Papers can create directories based on category, author, source, editor, and publisher. You can build your subdirectories based on any number of combinations of these, in whichever way makes most sense to you. For example: You may want to organize your documents first by author, then by category, and then by source. Keep in mind that each article will now be allocated to a folder based on the source of the article, a collected of source folders are within a category folder inside a folder dedicated to one particular author. There is always the option for Papers not to rename your files. If you prefer to keep your files named as they are (for instance if you are a lawyer and your secretary assigns file names based on case numbers or other parameters that are important to you). Simply uncheck the box next to "Rename files in library folder as". More information on file renaming is available here.